Chrome will automatically block ads on sites that fail the Better Ads Standards, using the approach described above. 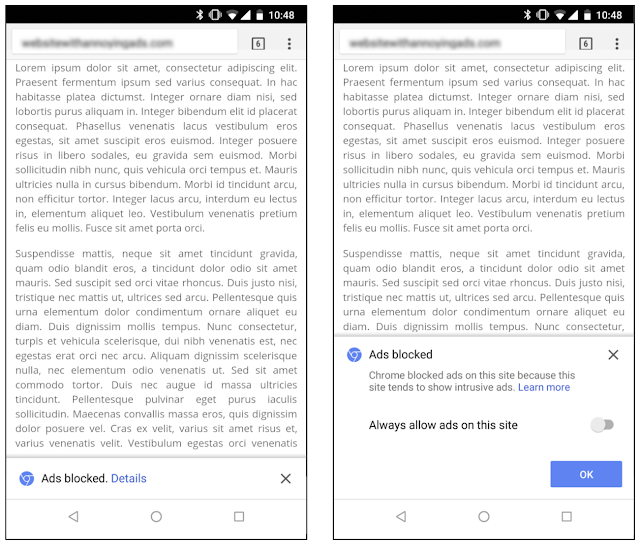 When at least one network request has been blocked, Chrome will show the user a message indicating that ad blocking has occurred as well as an option to disable this setting by selecting “allow ads on this site.” For desktop users, the notification in Chrome’s address bar will look similar to Chrome’s existing pop-up blocker. Android users will see message in a small infobar at the bottom of their screen, and can tap on “details” to see more information and override the default setting. We’re encouraged by early results showing industry shifts away from intrusive ad experiences, and look forwarding to continued collaboration with the industry toward a future where Chrome’s ad filtering technology will not be needed.